"It is amazing when used to mount a tom on a snare stand. I'm always skeptical of products and I have to say, everything Gauger makes benefits SOUND." As snare stand mounted toms became more popular, we began hearing from drummers hoping we would come up with a solution to the severe choking they were experiencing with their drums mounted this way. The result is the Flex Frame™. for years out on the road." Any type of pressure placed on or against the surface of a drum shell or counter hoop will affect the drums ability to resonate. The molded rubber ends of the snare stand arms are not sufficient to isolate the drum's resonance. The only purpose of the rubber is to prevent metal to metal contact between the arms and the counter hoop. More severe choking will occur when the snare stand arms are tightened against the counter hoop. on my Ludwig Superclassic 13 inch tom in the studio and it's AMAZING. ​Engineers and producers are going nuts over the sound." The unique combination of our aluminum band along with the snap on suspension clips is the perfect isolation solution. The clips provide a small amount of 'flex', so that the drum is not being clamped by a hard surface. This combination provides an excellent tool to isolate the drum and allows it to resonate as a unit without losing vibration to the snare stand. The drum can now be locked securely into place within the stand at any angle without loss of drum resonance. New in 2016, we have strengthened the Flex Frame™ clips to make them more durable without sacrificing their functionality. "I have been hoping for something like this and am so thrilled that you have finally solved this problem. ​It truly figures - it makes sense that the guy who invented RIMS® mounts would come up with this." The aluminum band snaps in and out of the clips easily, and the clips can be pulled back to allow fast access to tension rods for tuning or head changing. ​and has ended a much-too-long period of frustration with my tom tones." 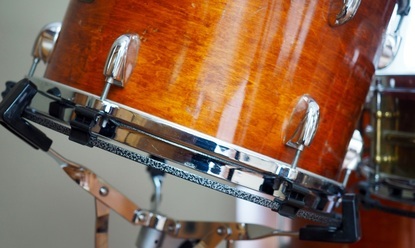 While the Flex Frame™ was developed to solve the choking issue in tom-toms, many drummers are discovering how well it opens up their snare drums. The difference is more subtle than in tom-toms, but it can add more openness and breadth to the drum. We noticed a difference especially with brushes and have had many drummers tell us how it has 'fattened' up their snare sound. "I love what the Flex Frame™ adds to the depth of my wood snare (the recordings are amazing)."